This is my first Songkran. Lucked out and had hired a van and driver for the weekend. No wet valuable papers (especially passports). I've heard rumours even being wrapped in plastic won't protect them. See these pictures and what do you think? I took them on Songkran Festival in KSR. How could you do that guy? Everywhere will be alot of people play songkran in any years. Billy and I just 'survived' the SongKran festivities here in Chiang Mai and lived to share our photos of the event. Wow 6 days. Ever get sick of it at any point? Thanks for sharing the pictures. In Chiang Mai, you either have to get into it or get out of town. This year we decided to play, and had a great time. The water stops at sun down, so you can go out to eat or whatever. I will go to the Philippines. 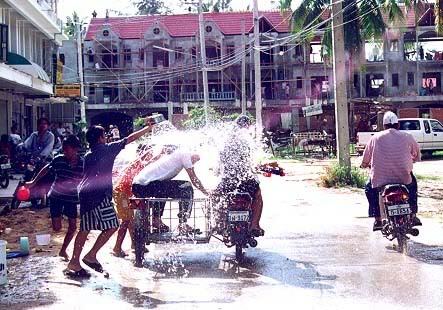 This year I saw people -both farangs and thais- throw huge buckets of ice cold water on people driving motorcycles, trying to make them wreck. Some nice people fill up their power guns with filthy water and then blast people in the face. On the last day they (April 19 this year) celebrate "Songkran" for 24 hours straight. Different strokes for different folks - I remember 'back in the day' natives who left New Orleans during Mardi Grais - for strange things like ski vacations and such. After ten straight - once in a while we'd do a family gathering in Reno right around Mardi Grais. Although - a party is a party - looks like fun! Hawaii's been "trying" for several decades to outlaw the fireworks anarchy on New Year's Eve & July 4th. Glad people are enjoying the photos! Truly, one must get involved or leave. We have celebrated Song Kran in China, Bangkok, Laos and in Chiang Mai. I only participated for 2 days. Then I pretty much holed up someplace safe. Wouldn't THAT be fun! what a great idea! Yes, it might seem unfathomable, but it is really quite do-able. (Just ask Lance!) Some internal restructuring of priorities required, however. Nice photoes. Thank you for sharing the photoes. Seems you had a really great times. That was not nice to do like that. I was in KSR. everyday while Songkran festival. But this year the Goverment of Bkk is quite strick for time to play. the police came to annouce that the people should stop playing water at 7 pm on the last day ( April 15, 07). That was too early for the young Thai and Farang people. But for my opinion it was good and enought for playing Songkran for 3 days and 3 nights. But anyway in Bkk we played Songkran only for 3 days. It started at April 13 - 15. Anywhere in Thailand still play Songkran after April 15? * retirement = perpetual traveler style with a $1000/month inflation-adjusted income with a 4% safe withdrawal rate from a portfolio. Is it me or are you also sick of the chaos that occurs on those two days in america? Everyplace I live it seems to get worse on those two holidays. Maybe I am odd but after watching the WTC fall on 9/11 explosions on a holiday just rub me the wrong way. When we were in Mexico for the decade of the 1990's, it was quite customary to throw 'crackers' at your feet to 'make you dance.' Unpleasant (to me) but verrrry common. Also, for any kind of celebration - including feast days, Catholic saints days, and all the holidays, the firecrackers were set off -- the noise makers and loud boomers during the mornings and various times during the day, and the colored sparkling ones at night. I agree with you -- with all the bombings, shootings and etc. that there are worldwide now, it can be most disturbing to hear these sounds when we are not familiar with all the local holidays... Which, I suppose is why the 'Songkran water festival' seems so harmless in contrast.